Selecting Stock Plants – September is a good time to begin making cuttings for starting next year’s plants. Lantana cuttings should be made from seasoned wood before any lush growth occurs after the fall rains. If the cutting wood is soft, the cuttings will rot or blast instead of developing roots. The colorful Jacob’s coat (Alternanthera) can be kept as cuttings over winter as can other types of herbaceous plants such as hibiscus, geraniums, coleus, ice plant, sultana and wandering Jew. By September, these plants are conditioned properly for taking of cuttings. Roses – The cool nights of September will stimulate new growth for a lush crop of bloom during early October. This means the last application of fertilizer should be made this month. Light liquid feedings will be very beneficial, or you may use your own pet brand of commercial fertilizer or rose food. Cottonseed meal is a wonderful food and should be used at the rate of one-half teacupful per plant and worked in lightly around each plant. Heavy watering should follow so that the rose plant may absorb the food. Throughout our section, the quality of fall roses often surpasses that of spring blooms, even though they are usually fewer in number. In watering, keep the water off the foliage and do not water after mid-afternoon in order that the plants can go into the night with surfaces dry. The usual disease and insect pests are prevalent during this fall season, so be on constant guard to protect these plants. If you’re a Northwesterner or a Northern Californian, put those dreaded memories of spring flood conditions behind you. Determine now to make this the year for a topnotch garden with bright flowers, finer shrubs and greener lawns. Make this a year of changes. Dont be content with the same old flowers of yesteryear. Take a good look at the flower seed stands at your neighborhood seed store and select lots of those brightly colored packets. One way to prevent your garden from looking just like every other garden in the block is to select some of the less familiar annuals. The “big three” – petunias, marigolds and zinnias – may be planted heavily, but at the same time be adventurous and try plants such as the exotic bells of Ireland, linaria and nemesia (especially good for covering a bed where spring bulbs are planted), appealing dwarf dahlias, fast-growing cosmos for hedge effects, and mixed gourds for their wonderful harvest of curiously shaped fruits in the fall. The cool weather annuals such as calendula, sweet alyssum, larkspur and nasturtium, can be sown in the open ground now. The seeds will germinate quickly if the ground is kept moist. After many years of pinching pennies and saving where you could, you have finally put aside enough money to afford a home away from the city in the suburbs. You have moved in and have everything looking swell, but look outside and suddenly remember that you are now responsible for your own lawn care and you do now own a lawn mower. 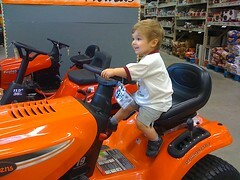 When you get to the hardware store you realize that there may be more to buying the right lawn mower than you expected. There are several mowers available. If you have a small lawn, you may find that a push mower that has no power other than what you supply does great. These lawn mowers have the advantage of actually cutting the lawn with a scissor action and help to avoid the brown tips at the ends of the blades of grass. One disadvantage is that mowing must be done regularly as these mowers do not do well in tall grass. For a larger lawn, you may want to add power to that lawn mower. One of the easiest ways to do that is to add a gasoline motor. 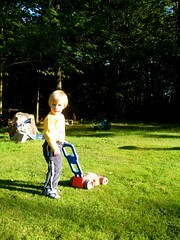 Gasoline mowers take less of your energy and are excellent at cutting grass. If taken care of, they are dependable for a long time. In the early spring dead leaves and litter should be removed from the lawn in the spring using either a broom or a light rake. Do not use a heavy steel rake. Aeration and liming, if necessary, may also be done at this time. Dead spots in the lawn should be raked with a steel rake to loosen the soil. Re-seed and then tamp level with the back of a shovel to firm the seed into the soil. An application of a turf fertilizer before active spring growth begins will provide a good start for the grass, and this can then be maintained by subsequent applications over the season. Fertilizers containing “slow release” nitrogen will nourish the grass for 1 to 2 months or longer following application. After excess moisture has disappeared, the lawn should be rolled to press back any turf which was heaved by winter frost. When you are ready to relax in your garden or lawn, you suddenly realize the importance of year round lawn care. A robust, healthy is not only a more comfortable place to relax with your friends, but it adds to the overall value of your home. The following are a few, easy pointers for maintaining a healthy, green lawn. Don’t take the lazy way out and cut your grass really short so that you don’t have to cut it again so often. As tempting as this practice might be, it is best for your lawn to leave grass at 6-8 cm. Cutting your lawn any shorter than this can damage the grass and root system, which is essential to a healthy lawn. Grass that is too short also loses moisture more quickly which can lead to dry, parched grass. Another thing that will damage your grass is cutting it when it is wet. Wet grass is easily cropped too closely and it may lead to rusted lawnmower blades. One of the easiest ways to enhance your property value is to work on developing a beautiful lawn. The problem with lawn companies and standard lawn treatments is that their use of chemicals places the environment and your pets at risk. Run-off created by chemical treatments can affect the population’s health by seeping into underground streams and polluting drinking water. Chemical treatment can also affect the ecological system by harming different organisms in the food chain. You can avoid these risks by using organic lawn care products. All soil requires different treatments according to its composition. A large part of lawn treatment depends on the pH of your lawn. Depending on the pH of your lawn your soil may be alkaline or acidic. Soil rich in limestone or chalk, is alkaline. Alkaline pH is anything above 7.0. Soil with pH below 6.5 pH is acidic soil. Knowing this information is important to the proper care of your lawn. Some people do not like to use organic fertilizer because of the offensive smell. There are other options, however, such as a granular fertilizer developed from treated sewage waste. This type of product is safe and complies with all state and federal regulations regarding environmental use. It is also odorless while providing your soil with much needed organic elements. These days it is important to make sure that one keeps down the cost of living as much as possible. Hard economic times have made us more and more aware of the fact that we have to save as much of our income as possible. This means that we have to make good purchase decisions and it is therefore a good idea to make sure you get the best lawn mowers for sale. There are various things that have to be taken into consideration when the decision to buy a new lawn mower comes up. Just take a few quick steps to make sure that you take the right decision. First, you have to ask yourself a couple of questions that relate to just how much you are actually likely to make use of the lawn mower. So one needs to think about how often the lawn needs to be mowed and this will depend to a large extent on the size of the grass you have to cut. If you have a small area of lawn that does not get cut more than perhaps once a month, it makes sense to got for a smaller model. If however, you have a large expanse of grass and need to cut it quite regularly then definitely opt for something bigger. Can An Aerator Solve Your Lawn Problems? What in the world is an aerator? Before you can read any more of this article, it is important to clear the air and get a good solid definition. An aerator is a lawn and garden tool that is used to make and keep your lawn and garden healthy. It does this by penetrating the ground and turning the soils to create holes in it which allows water and air to better reach the roots of grass and plants. If you live in an urban setting and you do have neighbors nearby then an enclosed compost bin design would be the better option because it will help to keep bad smells away. When choosing a wooden compost bin design, be aware that your selection of materials can be important. Keeping these considerations in mind when choosing a compost bin design will help to ensure that you choose the right design for your needs and one that will last you for many years to come. This is because wood that is not treated or resistant to rot will begin to deteriorate at the same time as the materials in your compost. You should always choose either treated lumber or a type of wood that is naturally resistant to rot. In choosing which compost bin design is best for your needs, it is often wise to consider where you live.